I’ve been fascinated by Mickalene Thomas since I saw her piece at the Virginia Museum of Fine Arts in Richmond this spring. I’ve seen a few of her pieces in person since then, and have found her interiors particularly interesting. Thomas’s work in her portraits and her interiorscapes is often lush and richly materialed. I have found myself increasingly compelled by the creative capacity of material culture in my own life: drawn to textile and ceramic and the richness of interior space. A year or two ago on one of my many visits to the Baltimore Museum of Art’s inimitable Cone Collection, it occurred to me how important surrounding himself with material culture — and particularly textiles — had been in Matisse’s work, and how resonant that feels in my own creative life. Thomas’s work has always struck me as falling into this same lineage. Full of the energy of material, both in her subject and her technique. 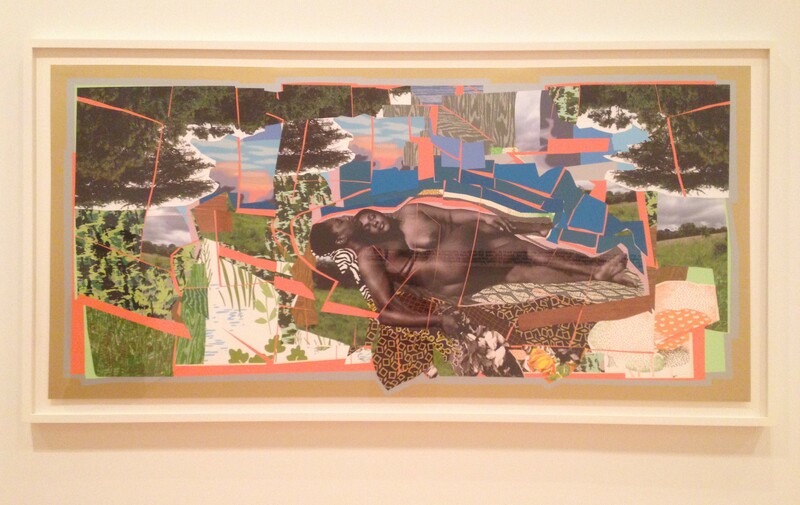 For more on Mickalene Thomas and her work, I was fascinated by her reflections on interior space and her own artistic evolution in this interview.